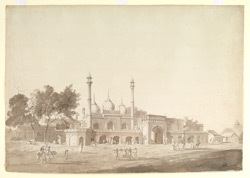 Mosque of Nawab Bahadur Javed Khan built by order of Nawab Qudsia Begum outside the Delhi Gate of the Red Fort, Delhi. 23 February 1789.
bl.uk > Online Gallery Home	> Online exhibitions	> Asia, Pacific and Africa Collections	> Mosque of Nawab Bahadur Javed Khan built by order of Nawab Qudsia Begum outside the Delhi Gate of the Red Fort, Delhi. 23 February 1789. Qudsiya Begum, also known as Udham Bai, was a queen of the Mughal emperor, Muhammad Shah (1702-1748), and wielded considerable influence during the early stages of his reign. When her son, Ahmand Shah, succeeded to the throne in 1748 Qudsiya Begum and her confidant Prime Minister Javid Khan held the true reigns of power. She was an enthusiastic patron of the arts and architecture and is best known for the palace and garden complex known as Qudsiya Bagh. The mosque that she built with Javid Khan is known as the Sunahri Mosque (1750-51) and once had metal-plated domes. Although the mosque is small the lofty minarets and large bulbous domes give the building an ostentatious appearance.